I purchased a D-LINK DSL 2750U some days back as my old router was having wifi a/b/g and not n. I wanted wireless n to increase the coverage in my house. This router is cheap as compared to other routers like Linksys, Belkin, etc but it is feature rich nonetheless. One of the free gift I got with the router was that it had a usb port. I could use the usb to either connect a hard disk or a usb printer which I have. I already bought a NAS drive some days back so I chose the usb printer option. To connect a printer to a usb port of a router is a non standard thing which not many people are aware of. Fortunately I found a document of the setup on Windows 7 on D-LINK ftp site and is as mentioned below. The installation is pretty straightforward if you follow the guidelines. Taking cues from the guide I started my venture into installing the printer on my Mac. The setup is difficult on the mac because many things are hidden and still it does not work perfectly but it works nonetheless. I ran Packet Sniffer on the Windows Laptop and it showed that the Printer is sending traffic on port 631 which is IPP. Also, after following the traffic stream, it showed the whole request from the Laptop to the printer. It was sending the Print to http://192.168.1.1:631/printers/HP. Also, before any time you try to print for testing, reboot the router. For some reason, it is not working when you do not reboot the router before printing. The experts on Printers might be better able to help on this.  Insert the Printer name and make and model of your printer. In this case, it was HP and HP Deskjet 1050. You must use the same name of the printer while setting up your mac. 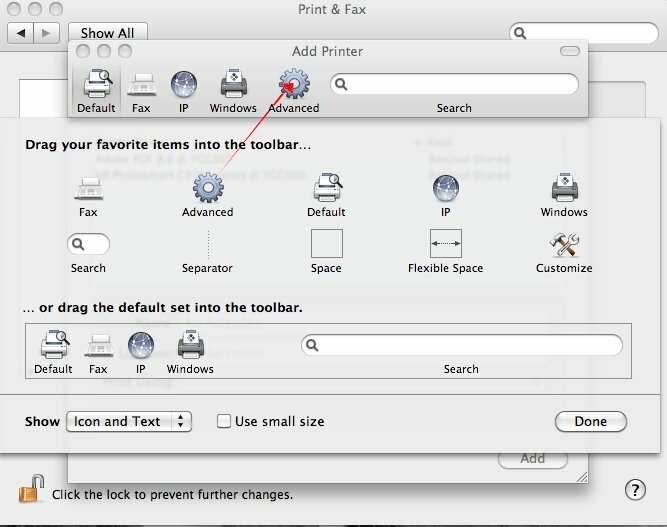 Click the ‘+’ button to open the Add Printer window. You should be able to print now. The experts on Printer can comment as to how to enable one way communication between Laptop and Printer as the USB can only take input from Laptop but not send back the reply from Printer to the Laptop. 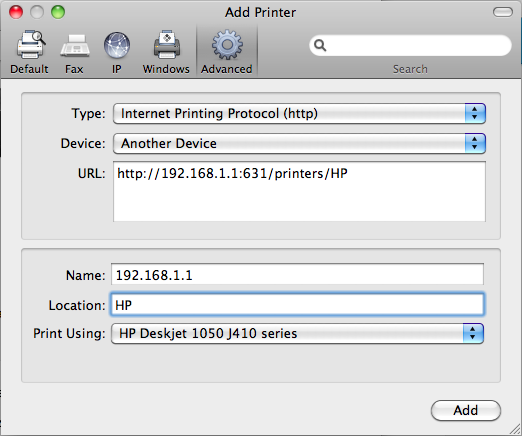 I tried changing the settings in CUPS to not wait for input from the printer but still it is not working except after rebooting the router. Will be looking forward to your expert inputs. This entry was posted in Mac and tagged dsl 2750u, mac os x, print server, printer, usb by samirsogay. Bookmark the permalink. Sorry, I can’t say because I no longer have the setup to check.